MIDPAC are now supplying Farmhouse Bakery with all their branded supplies. In addition to their printed cotton bags, MIDPAC also now supply Farmhouse Bakery with all their general packaging materials, printed paper bags, printed carrier bags and embroidered work shirts, work blouses and aprons. In these challenging times, a consistent brand image is essential to differentiate your business from the competition. By choosing MIDPAC to supply end-to-end, branded products, Farmhouse Bakery have given their business a consistent and professional image which really makes them stand out from the crowd. Why not improve and unify your company's branding by giving MIDPAC a call to discuss your requirements? 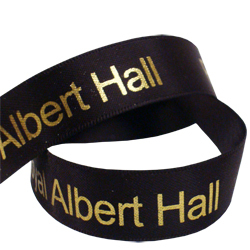 MIDPAC are now producing printed ribbon for the Royal Albert Hall. The range includes luxury double-faced satin ribbon, printed with metallic gold lettering. Our complete range of printed ribbon can be seen in the printed ribbon gallery on our sister site, http://www.printedribbononline.co.uk/ If there's anything you need that you can't see there, don't hesitate to contact us directly and we'll do everything we can to help you out.